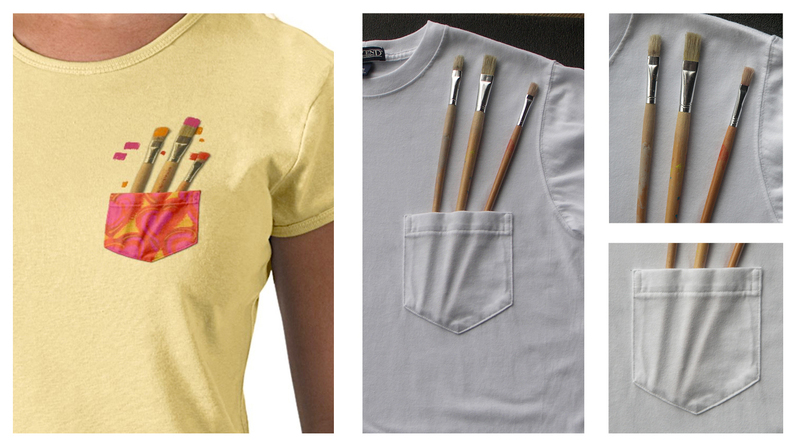 When I wear my tee shirt designed with the faux breast pocket full of paint brushes, I can count on double-takes and usually a comment or two. The surprise of this illusion seems to make people smile. For myself, I love fun clothes and wanted the shirt and design to look intentionally made for each other. 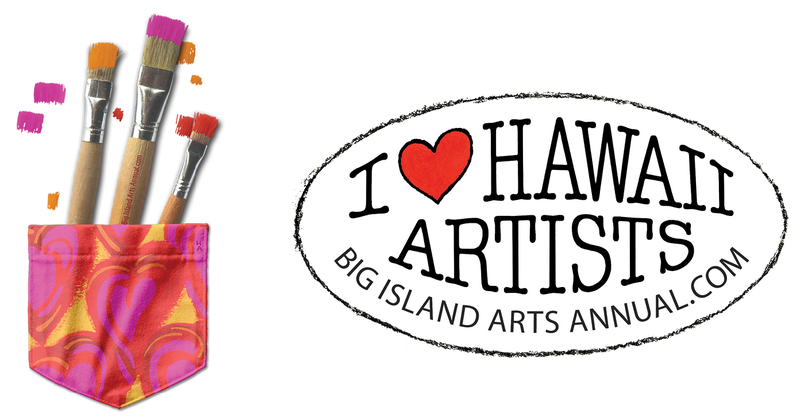 The result is relevant to my personal style and to the client, Big Island Arts Annual. For the design inclined and otherwise curious, a brief tour of how the illusion was created. First, we shot a concept photo with the tee shirt spread flat. I positioned the brushes in the pocket, just so, to capture the bumps and shadows of the handle shapes inside. Since we were working on the floor, the angle of the shadow was easily adjusted by rotating the subject. In order to get good close-up focus on both the pocket and the brush tips, we took two separate photographs. The photograph of the heart painting was handy from a previous photo shoot, so I was ready to bring all my parts and pieces into Photoshop. I didn’t have the kind of short stubby brushes that I wanted for this design so I shortened the ones I had. After clipping out the white tee shirt background, I cut away most of the long wooden handles. Then I positioned the brushes individually, behind the bumps in the pocket. To keep it looking real I adjusted the angle of each brush, just a little. Next, I layered the hearts painting over the pocket image. I made the pocket extra high contrast so it would show up more under the painting. I made the painting extra bright to compensate for the partial opacity that allows the pocket to show through. For the paint blobs, I copied a portion of the bristles and filled them with semi transparent colors that were sampled from the heart painting. Semi transparent colors allow some of the bristle details to show through so the blobs don’t look flat. I copied these same color shapes to scatter a few behind the brushes. Now it looks like the brushes were still wet with paint when the artist stuffed them in their pocket. Sometimes it takes a few tries to get that perfect “random” pattern. I worked it until I was satisfied.